“Where are all the animals?” That’s what Irene Crowson wondered as she, with other Canadian Women’s Institute members, rode the bus from Helsinki to Turku. There were miles and miles of beautiful green fields but there wasn’t an animal in sight. “What do they do with all that wheat and grain, ship it away?” Irene speculated. Finns wondered why Canadians would leave their animals out in all weathers. It seemed odd and even unkind. Irene was also surprised to learn that farming Finns are guaranteed generous holidays each year. While the farmers are on holiday the government sends people in to look after their stock and crops. Farmers in Canada can only wish. It’s not exactly the sort of education founder Adelaide Hoodless planned when she began the Women’s Institute. Bringing women together across the globe highlights differences as well as similarities. The Women’s Institute is a Canadian success story. It began one hundred and ten years ago in Ontario as an educational group for rural women. Today its international body, the Associated Country Women Of The World, is the biggest women’s organization in the world. It’s active in over seventy countries. There are chapters in India, Australia, New Zealand, the South Pacific, most African countries, the U.S., the European Union, and China. A.C.W.W. has a representative at the United Nations. When it spread from Canada to England, where it’s much more prominent than it now is in Canada, it became known as “Canada’s gift to England.” It’s a gift of which Canadians can be proud. The current head of the international organization, which has its headquarters in England, is from the Philippines, the previous president was from England. The focus is on women’s education, women’s health, and women’s rights. All three were important to Adelaide Hoodless. After her son died from drinking un-pasteurized milk, she realized the need for more information for women. On Feb. l9, l897, in Stoney Creek, Ontario, she founded the first Women’s Institute to educate women, especially rural women, about such matters. In that era there were few libraries and little access to continuing learning. Often boys, but not girls, would have high school or university educations. Many men were apt to think that their wives would be better occupied home baking bread than sitting in someone’s parlour learning about disease. But, the Women’s Institute was developed in conjunction with the Farmer’s Institute and had the support of the F.I. members. Farm wives’ continuing education was carried on in those monthly meetings. The Women’s Institute was instrumental in getting Home Economics taught in the school system. Gradually these women realized the importance of legislation. Those parlour sessions shared information about more than running a household. Country women were learning how to draft and submit resolutions. The Women’s Institute began as a rural organization. In some parts of Canada, the Peace River region of B.C., for example, membership is still mostly rural. As is the case with many other service groups membership has declined a bit, although it is still strong in the countryside. This adaptable organization is changing as Canada’s population changes. Many of the W.I. groups are now urban based. 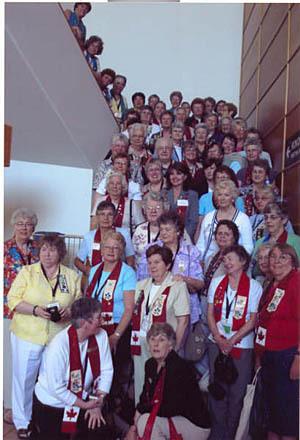 In Kamloops, the Overlander Women’s Institute to which Irene Crowson and Lynda Desrocher belong, is still committed to the goals of Adelaide Hoodless. There are educational meetings in member’s homes. It supports such community groups as Meals on Wheels, Breast Cancer Research, and “Families First”, a Xmas dinner or lunch for families. They raise funds the traditional way, by bake sales and craft fairs. There’s always been a social aspect to the Women’s Institute, a very important feature one hundred years ago where farm wives were more isolated. The social part is still important, especially now that it has an international aspect. 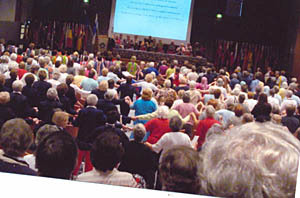 Every three years the annual international convention is held in a different part of the world. In June 2007 it was in Turku, Finland. In 2010 it will be in the U.S. In 2013, it will be in China. Chinese women just joined the Associated Country Women of the World in the last three or four years. 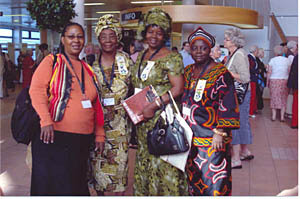 At the Pretoria meeting there were seven hundred and fifty delegates from thirty-seven countries. In Africa most of the small farms are still run by women. 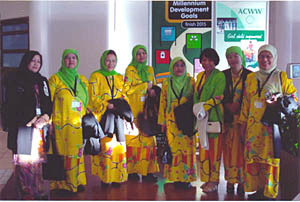 The presence of a group which will train and educate women is very important, and many women belong to the A.C.W.W. Education and help can take many forms. The Association has bought sewing machines for women and taught them to use them. It’s bought goats so babies could have milk. In the village of Katek in Uganda, the Association started a piggery. It brought in pigs, and showed the villagers how to care for them. Both women and men were involved. Funds raised paid for essentials for the villagers, and for school supplies. Any surplus was put back in to support the piggery. The final report showed that one hundred and twelve women, four hundred children and thirty men were helped by the project. The A.C.W.W. has installed stand pipes to provide safe drinking water, in villages in Kenya and Uganada. It funded a basket-making project in Andhra Pradesh province in India. Twenty-five women were taught literacy along with basket making. The Association chooses enterprises which will become self supporting, which will provide income for families or for an entire village. If an application for funding is approved it’s carefully set up and thoroughly monitored. Actually talking to women from other countries provides insight. “Sending” instead of “taking” items for example. Women from Fiji informed WI delegates that books and material mailed to them never arrived. Take them if you can, they were told. Women from different countries have different priorities. African women are very focused on the AIDS epidemic there. One topic at the 2007 conference in Turku was obesity. Western women who raised the topic of female circumcision in Pretoria were firmly told by some delegates that it was a cultural matter outside the scope of the Country Women of the World. Adelaide Hoodless would be very pleased.